LUCENA CITY - Ten finalists from among various multimedia journalists - print, photo and online - in the country competed for the top prize in the 2018 Save the Children Media Awards. 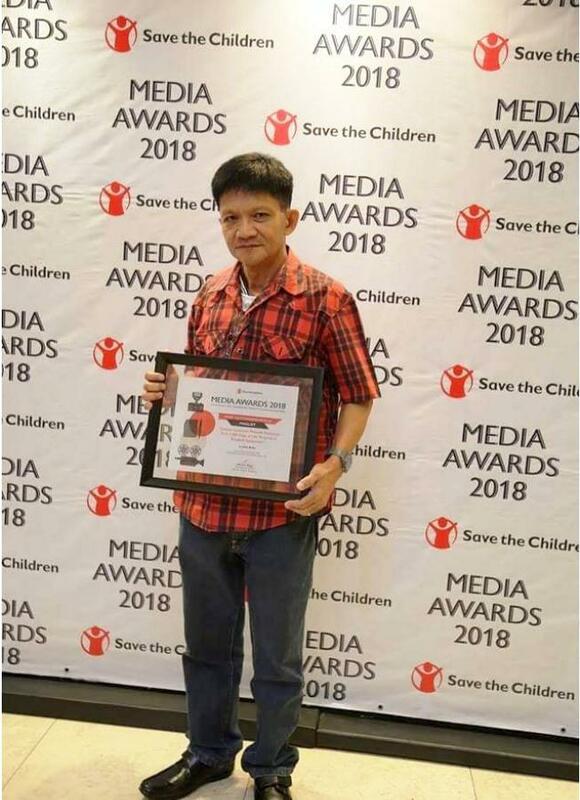 The 2018 Save the Children Media Awards with a theme about ‘Uncovering Child Hunger and Malnutrition in the Philippines’ aims to recognize exceptional works of multimedia journalists from all over the country that showcase the alarming problem of hunger and malnutrition suffered by millions of Filipino children. Among the 10 finalists in the Article Category included Sentinel Times Editor-in-Chief John A. Bello whose news story was published last year in Business Mirror entitled “Quezon gov presents province’s ‘First 1,000 days of Life’ program in Bangkok symposium”. Bello has been a news correspondent of Business Mirror covering Quezon province. The awarding was held on Nov. 22 at Silver Lotus Events Place, South Triangle in Quezon City. Other finalists were: Atty. Joey Lina, ‘Malnutrition: A Gnawing Crisis Needing Urgent Action’; Katerina Francisco of Rappler, ‘No Hungry Child: Malabon’s Feeding Program Aims to Fight Malnutrition’; Phil. Daily Inquirer Editorial, ‘Our Hungry and Stunted Children’; Rona Fernandez, ‘Pulling a Generation from Malnutrition’s Clutches’; Cherry Lim, ‘Special Report: ‘Busy’ Parents, Convenience Fuel Child Malnutrition; Leah Agonoy, ‘Zambo del Sur’s Jonathan Oya: The Face of Severe Malnutrition’; Jeff Canoy and Nicole Villavecer of ABS-CBN, ‘A Prince of Skin and Bones; Jonel Amio, ‘Malnutrition: A National Emergency, Too; and Ma. Isabel Ongpin, ‘Malnutrition Must Become a Thing of the Past’. The top prize went to Canoy and Villavecer who received a trophy and cash prize of P30,000. Finalists all received a glass plaque and P5,000 cash each. Criteria for judging in the Article category were Creativity and Exceptionality, 30%; Organization and Structure, 20%; Relevance and Appropriateness to the Theme, 30%; Information and Educational Value, 20%, a total of 100%. Other categories in the media awards are for Photo and Film which covers Special Feature, Short Film and Full-Length Film. UNTV’s John Vincent Martinez received the award for People’s Choice Photo for his work entitled “Kaldero”. The GMA team received the Most Outstanding Special Feature award for the report “Ilang pamilya sa Navotas, naubusan ng NFA rice” on Reporter’s Notebook. The GMA team also received the award for Most Outstanding Short Film award for “Papag” on Front Row. Noel Celis, whose photo won Most Outstanding Photo, and Ramona Diaz, whose film “Motherland” won the Most Outstanding Full-Length Film award, were unable to attend the awarding ceremonies. Atty. Alberto Muyot, chief executive officer of Save the Children Philippines, did the welcome remarks; while Sen. Risa Hontiveros, delivered the keynote message. Save the Children Media Awards aims to encourage and engage more media practitioners to continue raising the public’s awareness regarding the reality of hunger and malnutrition’s impact on Filipino children and their families, give everyone a better understanding of its implications, and keep it in the public radar to ensure that all concerned take on the necessary action to end this vicious cycle.